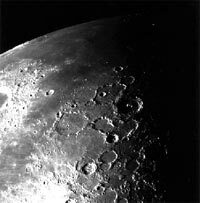 We have known about craters on the Moon since the invention of the telescope. In the past, people have suggested that lunar craters were formed by volcanoes, bursting bubbles in a lava sea, asteroid impacts, and even interplanetary lightning bolts(!). But information gathered during the early part of the Space Program proved that lunar craters were formed by impact. Rocks and asteroids of all sizes crashed into the surface of the Moon at tremendous speeds, and caused giant explosions that dug huge holes. Galileo image of N. Polar area of the moon. Image courtesy of NSSDC. As you can see from this picture of the Orientale Crater on the east side of the Moon, some lunar craters are big enough to drop in whole states! This crater is nearly 600 miles across and has three rings. Smaller craters have two rings, and still smaller ones have none. You can also see huge streaks of rock and dirt that were blasted outward (from the center of Orientale) over a thousand miles. Orbiter IV image of Orientale Crater. Image courtesy of NSSDC. As we explored the other planets and moons in the Solar System, we found impact craters everywhere! Mercury! Ganymede! Triton! Venus! As you can see from the picture to the left, we even found that Mars, the most Earth-like planet, not only has volcanoes and canyons, but also lots of craters! 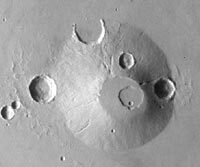 Viking Orbiter image of Uranius Tholis. Image courtesy of NASA JPL.